Getting straighter teeth and a better smile is not always easy. Although the invention of braces has taken dental structuring to new heights, there are certainly some downfalls. Braces are designed with brackets connected by wires. Once they are in your mouth, they are “there for the long haul”. It can be difficult to brush and floss the teeth with braces due to the structured device which cannot be removed by the patient. However, the invention of Invisible braces has made life a little bit easier for patients. Invisible braces are a series of custom made retainers made of a clear plastic or acrylic material which is tightly fitted over the teeth. During the treatment period, the orthodontist will fit the patient with several versions of the invisible braces. Each version contains a slight adjustment and is exchanged every few weeks to gradually move the teeth. Unlike traditional braces, aligners can be removed while eating, brushing and flossing to help keep the teeth clean while they move into a better position. Invisible braces are not for everyone. Since these braces are custom built for a tight fit, they are only recommended for teens and adults because young mouths are still growing and developing. The best candidates are people who have mild to moderately crowded teeth. People who have spacing issues, severe overbites, underbites or crossbites are typically not good candidates because they may need a more complex treatment to correct their issues. 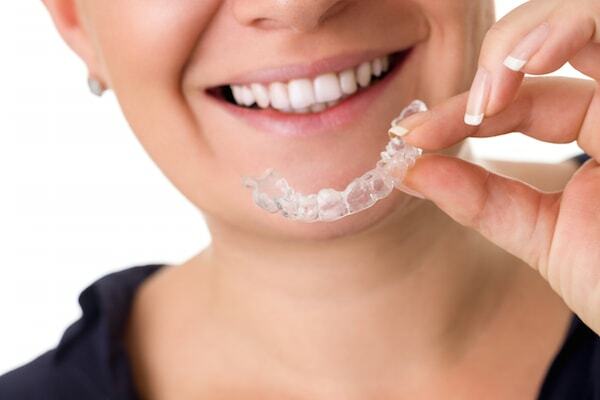 Although Invisalign is the leading producer of clear braces, there are several brands on the market including Inman Aligner, Clear Correct and Smart Moves. A dentist will be able to help patients make the best choice in regards to traditional braces or invisible braces to correct any issues. Traditional braces could require many years of wearing in order to correct the issue but, depending on how much the teeth need to move, invisible braces can be worn for a significantly shorter time period. The treatment period is generally 10 to 24 months. However, the more crooked the teeth or the more the bite is off, the longer it may take to wear them. In some cases, adults who had braces as a child may notice their teeth have slightly shifted over the years. Invisible braces can usually correct this issue in as little as 10 weeks. Although invisible braces are great for adults who want to conceal their dental treatments, it is important to understand that they are not as accurate as traditional braces. Therefore, some patients may need braces for a few months at the end of their invisible braces treatment in order to make small adjustments. The cost of invisible braces can vary depending on the individual dentist or orthodontist. Generally, invisible braces cost in the area of $5000-$6000. For many people, the cost may scare them off considering dental insurance rarely covers much of the bill. However, the teeth a person is born with are there forever so they need to take care of them.